Download "FIRST ANNUAL REPORT ON THE LATIN AMERICA SMALL BUSINESS LENDING INITIATIVE AUGUST 2008"
2 targeted Latin American countries and recommends the design and implementation of regulations and oversight of credit providers to small businesses. In addition, the MIF will engage at a regional level through the Latin American Association of Supervisors of Banks of the Americas (ASBA) to facilitate cross-border seminars and workshops to define and promote the adoption of best practices in SME and micro-lending among its members. The Initiative was designed to show measureable results in the form of an increasing volume of lending by commercial banks to small business, and a decrease in the average loan size in order to reach the smallest businesses of the region where the poverty reduction and employment gains are multiplied. The participating banks have agreed to report on lending indicators in order to measure the impact of the Initiative. II. ONE YEAR LATER Since its launch, the Initiative has been very active in advancing the three goals originally established by Secretary Paulson: i) Introduce new lending models that fit the unique characteristics of smaller firms. In September 2007, the MIF committed $10 million in technical assistance grants to the Initiative and has since been actively promoting the Initiative among financial institutions in Latin America and the Caribbean. The first agreement was signed in November 2007 with BanCentro in Nicaragua for $500,000 (with an additional $500,000 contribution by BanCentro) to develop new financial products for small businesses, expand BanCentro s small business loan portfolio, strengthen capacity of its human resources in the analysis and management of risks specific to the small business sector and adopt international best practices in implementing and expanding its small business program. Another $500,000 grant was approved by the MIF in July 2008, with a matching counterpart contribution, to provide technical assistance to Banco Agromercantil and support it in its efforts to increase its operations with small businesses in Guatemala. 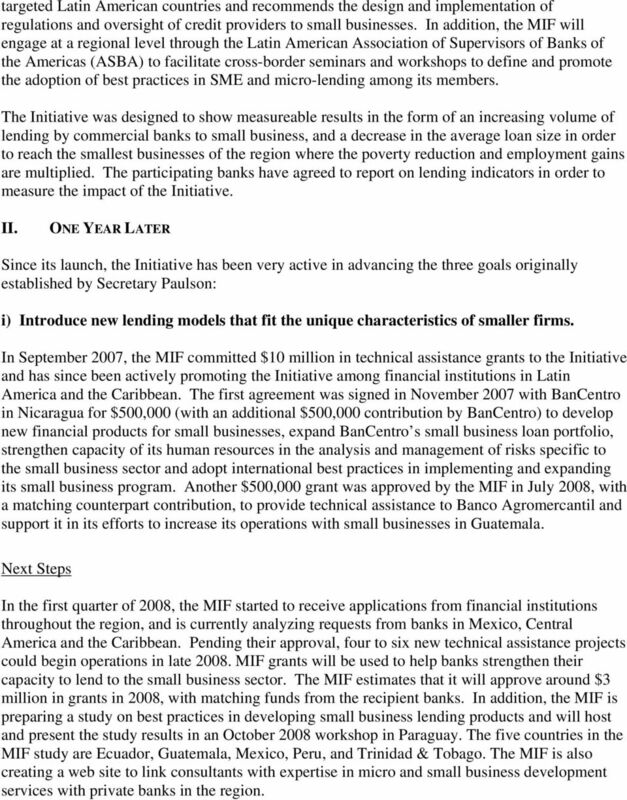 Next Steps In the first quarter of 2008, the MIF started to receive applications from financial institutions throughout the region, and is currently analyzing requests from banks in Mexico, Central America and the Caribbean. Pending their approval, four to six new technical assistance projects could begin operations in late MIF grants will be used to help banks strengthen their capacity to lend to the small business sector. The MIF estimates that it will approve around $3 million in grants in 2008, with matching funds from the recipient banks. In addition, the MIF is preparing a study on best practices in developing small business lending products and will host and present the study results in an October 2008 workshop in Paraguay. The five countries in the MIF study are Ecuador, Guatemala, Mexico, Peru, and Trinidad & Tobago. The MIF is also creating a web site to link consultants with expertise in micro and small business development services with private banks in the region. 3 ii) Assume a portion of the risk associated with small business lending. 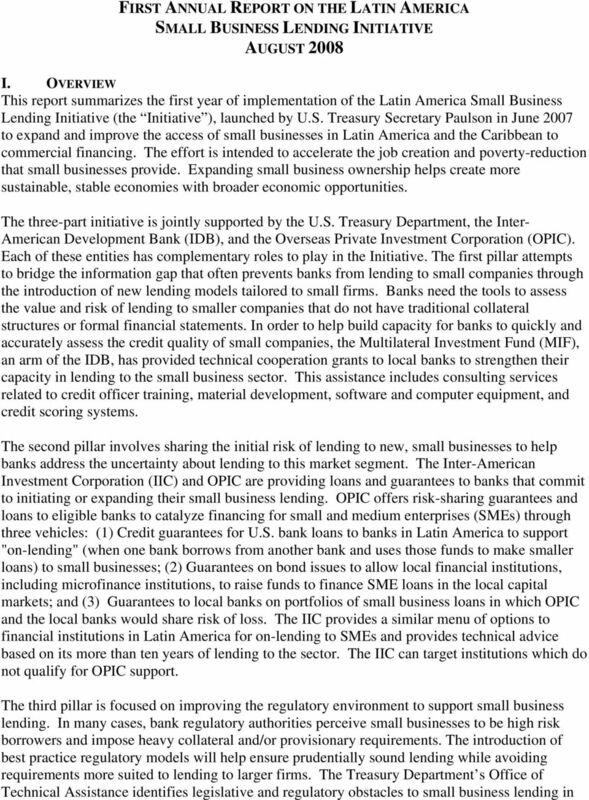 In September 2007, OPIC launched its participation in the Initiative by committing $150 million to provide financing and guarantees for small business loans in Latin America and the Caribbean. Already, OPIC has approved $53 million in loans to banks in Honduras, Costa Rica, Ecuador, and Paraguay to expand their operations in the small business sector. Typically, OPIC assumes between 50-80% of the commercial risk attached to each loan and in some cases provides additional inconvertibility of currency coverage as well. IIC has signed six deals for a total of $14.5 million. Institution Country/Institution Project Size ($mil) 2/ Projected # Loans Average Loan Size OPIC Honduras $15.0 2,300 $25,600 OPIC Costa Rica $ $140,000 1/ OPIC Ecuador $ ,000 $3,000 OPIC Interbanco (Paraguay) $ $59,000 OPIC BBVA (Paraguay) $ $53,000 OPIC Banco Regional (Paraguay) $ $77,000 IIC Edyficar (Peru) $5.0 IIC Demerara Bank (Guyana) $2.0 IIC Costa Rica $2.0 IIC Mexico $3.0 IIC Credipyme (Mexico) $1.0 IIC Microfin (Uruguay) $1.5 TOTAL $67.2 1/ Under the terms of this loan agreement, the local bank is required to allocate at least 50 percent of OPIC proceeds for loans under $100,000 to SMEs. The other 50 percent is allocated for a combination of SME and mortgage lending. 2/ Counts funds dedicated specifically to the Initiative. 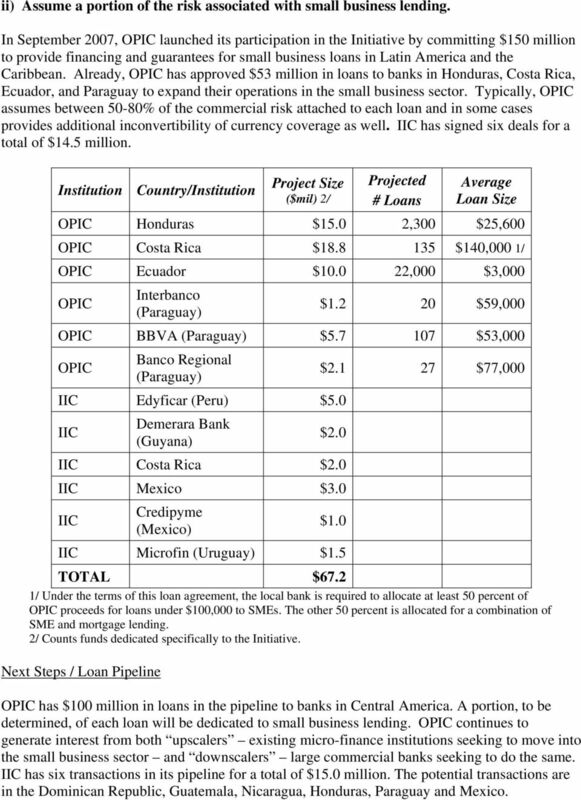 Next Steps / Loan Pipeline OPIC has $100 million in loans in the pipeline to banks in Central America. A portion, to be determined, of each loan will be dedicated to small business lending. OPIC continues to generate interest from both upscalers existing micro-finance institutions seeking to move into the small business sector and downscalers large commercial banks seeking to do the same. IIC has six transactions in its pipeline for a total of $15.0 million. The potential transactions are in the Dominican Republic, Guatemala, Nicaragua, Honduras, Paraguay and Mexico. 4 iii) Ensure that small business lending is not unnecessarily constrained by burdensome regulations or bureaucracy. To kick off its program, OTA along with the MIF and OPIC presented the Initiative to the Latin American Bankers Association (FELABAN) in November 2007 which was well received. 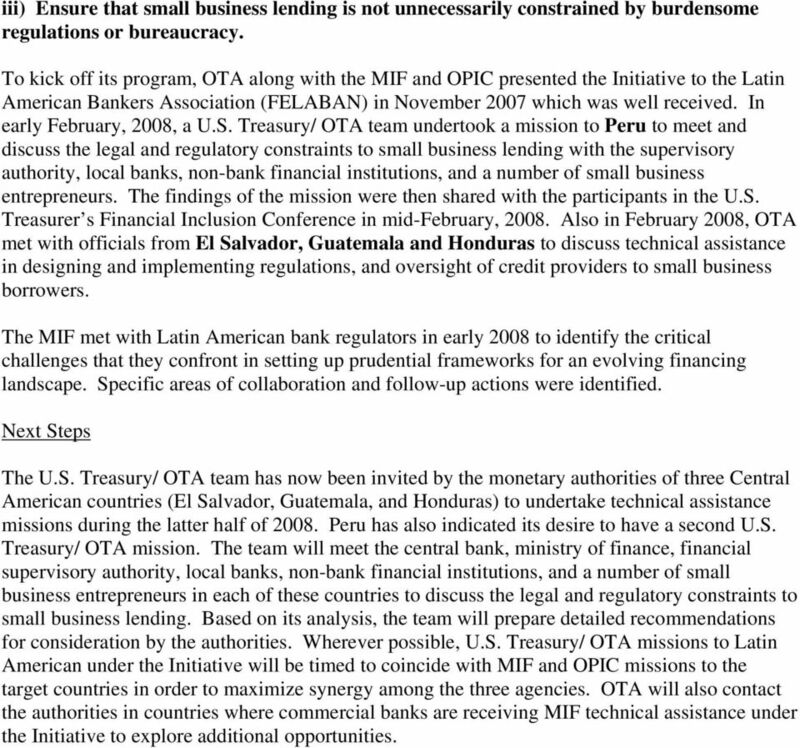 In early February, 2008, a U.S. Treasury/ OTA team undertook a mission to Peru to meet and discuss the legal and regulatory constraints to small business lending with the supervisory authority, local banks, non-bank financial institutions, and a number of small business entrepreneurs. The findings of the mission were then shared with the participants in the U.S. Treasurer s Financial Inclusion Conference in mid-february, Also in February 2008, OTA met with officials from El Salvador, Guatemala and Honduras to discuss technical assistance in designing and implementing regulations, and oversight of credit providers to small business borrowers. The MIF met with Latin American bank regulators in early 2008 to identify the critical challenges that they confront in setting up prudential frameworks for an evolving financing landscape. Specific areas of collaboration and follow-up actions were identified. Next Steps The U.S. Treasury/ OTA team has now been invited by the monetary authorities of three Central American countries (El Salvador, Guatemala, and Honduras) to undertake technical assistance missions during the latter half of Peru has also indicated its desire to have a second U.S. Treasury/ OTA mission. The team will meet the central bank, ministry of finance, financial supervisory authority, local banks, non-bank financial institutions, and a number of small business entrepreneurs in each of these countries to discuss the legal and regulatory constraints to small business lending. Based on its analysis, the team will prepare detailed recommendations for consideration by the authorities. Wherever possible, U.S. Treasury/ OTA missions to Latin American under the Initiative will be timed to coincide with MIF and OPIC missions to the target countries in order to maximize synergy among the three agencies. OTA will also contact the authorities in countries where commercial banks are receiving MIF technical assistance under the Initiative to explore additional opportunities. CASE STUDY CrediFactor The factor that multiplies earnings 1 IntroducTIOn CrediFactor commenced operations on March 17, 2000, taking on a major challenge, as factoring in Nicaragua was not yet developed. FCPA and Anti-Corruption in Latin America May 2011 FCPA Enforcement "FCPA enforcement is stronger than it's ever been and getting stronger. We are in a new era of FCPA enforcement; and we are here to stay." Electronic Finance: A New Approach to Financial Sector Development? 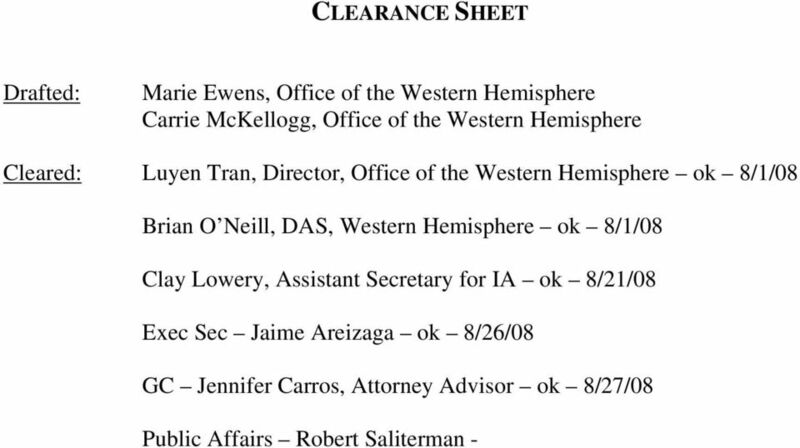 Federal Aviation Administration FAA International Strategies 2010 to 2014 Western Hemisphere Region The Western Hemisphere portfolio includes North America, Central America, South America, and the Caribbean. GLOBAL CREDIT REPORTING PROGRAM (GCRP)* January 2015 *Formerly known as Global Credit Bureau Program. GCRP at a glance Number of countries where advisory services were provided in FY13: over 60 countries. Impact Investing. Presented by: MicroVest Capital Management, LLC. Gil Crawford, CEO David Wedick, Business Development Officer MICROVEST.